Who does not like to visit a happy place with loved ones to have a time of their life! I read about the ’Creating Happy Traveler’ contest just as I was about to hit the bed after a long day in the office. I asked my wife where she would like to go, given an opportunity. ‘Switzerland’ she replied without batting an eyelid! ‘Absolutely’ I quickly added, ‘who would not like to travel to the land of pristine Alps, the crystal clear lakes, green meadows, milk and chocolate and punctual Swiss watches, I mumbled as I fell asleep, soon engulfed in the world of dreams! My fantasy began to unfold with the screeching of the tyres of the aircraft on the tarmac of Zurich airport! It was a pleasant experience to go through the airport express metro from the aerobridge and hear the recorded welcome sound of cows in the metro ride lasting a minute. After clearing the immigration,I endorsed my ‘Swiss Pass” at the rail terminal located within the airport. The Swiss Transport System is as efficient as their legendary watches!! The train left Zurich HB terminal at the precise time and zipped through the darkness to arrive at the Lucerne station in an hour. We hired a taxi to reach the hotel and checked in as a crowd of boisterous youngsters reveled in the foyer at the late night hour. A safe place indeed! We planned to visit Mt Pilatus and were confused from the maze of options available to travel, by rail, boat or bus. A rotund girl at the booking office of SBB helped in making the decision. … A boat ride (90 min) to Alpnachstad, then a ride up the Mt Pilatus by a cogwheel railway right to the peak Pilatus Klum. On return it would be a gondola ride till Frakmuntegg via Krienseregg. Yet another gondola trip till Kriens and then return to Lucerne by a bus. We were spoilt for choices! The city of Lucerne resembled a story book setting of fairy tales with beautiful church spires, castles, and green meadows as far as the eyes could see. There is a local legend that hundreds of years ago, anyone who dared to climb Pilatus would never return alive as the ghost of Pontius Pilate that lay buried in the lake would surface and devour the individual. Much later, some optimistic men threw boulders in the lake to kill the ghost and ever since, ‘brave people’ like me venture to the peak!! The ride by the steepest cogwheel rail from Aplanchstad till Pilatus through a 60 degree incline and a maze of tunnels till the snow clad peaks is unforgettable. The ride down the hill by the gondolas followed. At the exit gate of the Mt Pilatus are a chain of clocks displaying the time in five continents. One only wishes that time stands still when visiting such a lovely place. On reaching Lucerne we visited Museum of Art and were immersed in appreciating the paintings. Next we visited the Lion Monument a little distance away. Eager to conquer Mt Titlis we boarded the train to Engelberg from where the ascent to peak would begin. The train ride along the Swiss country side was very refreshing as we kept going past picturesque locales. In an hour the train reached Engelberg, after climbing up a steep gradient on the last leg. It was amusing to see a tea stall selling exclusively Indian snacks, Idlis, Samosas, and Vada Pav here, an indication of the rising number of Indian visitors. The ride up the mountain peak is broken into several gondola rides, one from Engelberg to Trubsee and then to Stand. From Stand to Engelberg, the ride is in Rotair (a 360 degree Rota table) gondola to the peak of Mt Titlis at a height of 3020m/9900 ft. The temperature was -2 degrees Celsius and it was freezing cold. It was a visual treat to see the grandeur of the snow clad peaks, glaciers and crevices. Next we went to experience the ‘Ice Flyer’ which is a breath taking trip over the glaciers and the deep valleys straight out of a James Bond movie. We returned to Lucerne to visit the beautiful Charles Bridge, just across the station. This bridge is very old and made out of wood with beautiful paintings inside. Having collected our luggage we boarded a train to Interlaken which was our next halt. The glass windows provide an unhindered view of the most scenic route for the next two hours. We reached Interlaken where we were to stay for next two day. Ursula the owner of the hotel offered us ‘Lemon tea’ on arrival. In a few minutes we settled in a nice wooden room overlooking the Mt Jungfrau at a distance. I had fallen with love with the lovely city of ‘Interlaken’. 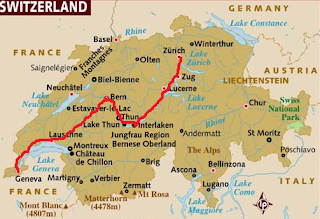 The city has a slim waist of land between two voluptuous lakes, Thun and Brienze and majestically rising Jungfrau peak. As I rubbed my eyes and looked out of the window, I stood mesmerized by the stunning view of majestic peak of Jungfrau, shimmering as the day was breaking. The chirping of birds in the garden and the whiff of alpine air were so refreshing that I could live here forever, if I had a choice. A breakfast of cereals, jams, cheese and fresh baked bread followed. 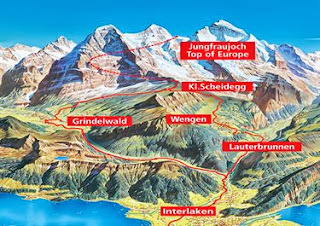 Ursula had carefully compiled list of tips to go to Jungfrau, including the route to follow. The Swiss Railways had carved into the steep inclines of the Alps in 1912(a century ago!) to create the route to access the highest mountain peak in Europe. We boarded the train to Grindelwald as this is the best route to enjoy sunrise. After reaching there we changed a train to Kliene Scheidegg, a small village atop the mountain, known for adventure sports like rock climbing and rappelling. There was one more change of train that goes through a maze of tunnels, while the passengers can watch a film on construction of the Jungfrau railway.It stops briefly en route to view the enchanting scenery of Mount Eiger, Monch and Jungfrau. Finally it arrived at Jungfrau which is at a height of 11333 ft.It had started to snow. There was a skiing mishap, when I flew in air as the sledge, that I rode hit a steep mound of fresh snow.A hilarious episode to remember! The return journey from Jungfrau was through Wengen and Lauterbrunnen route as the sunset in the west. On reaching Interlaken we took a ‘post bus’ to drive alongside the Thun Lake to enjoy the reflections of thousands of lights. A day to fulfill the cherished desire to visit Cheese and Chocolate factory at La Gruyere and at Broc two small towns in close proximity! We took a train to Bern that passed through the sleepy towns of Speinz and Thun. Here we changed train to Fribourg, a place famous for immense quality of milk production and the Cartier watch production facility. A short busride to Bulle where, we boarded a small two bogie train to Gruyere. The cheese production facility and restaurant are just across the station. A cow called’ Cherry’ does the narration of the story through dictaphone, giving an insight of how the cheese is produced. The visit would have been incomplete without tasting ‘fondue’. Next, halt was Broc-the home of Nestle/ Callier, world leaders in chocolate making. A guided tour takes one through the audio visual show and story of cocoa, the bean; it’s sourcing to modern day process in the manufacture of chocolates. One can see the fresh chocolates popping out of the machine. Finally, it is is a surprise treat of many different varieties of chocolate to eat to heart content. The day was devoted to sightseeing the capital city, Bern, the birth place of Albert Einstein. His house is also a major tourist attraction. The city also has the longest covered shopping promenade in Europe, almost 6 km long. We headed to the Bear pit, a natural habitat created for the bears in the midst of the city, along river Aare. We were lucky to sight of a huge mother bear suckling her two baby cubs. Next stop was the Parliament building at Bundes Platz an imposing building with 24 fountains in vicinity throwing jets of water in unison giving an appearance of a ballet performance. There are nice restaurants where people dine in open air.Across the other side of the street is Theater Platz, known for performing arts. Zytclogge is one of the oldest traditional clocks where one can see the working of a mechanical clock built 500 years ago, that is still operational. Along the street are a number of fountains with interesting stories of small children being taken away by giants (Ochre fountain). We visited the Rose Garden which is perched atop the hill .It provides a spectacular view of the city. Our final destination in Bern was the Paul Klee centre whose imposing structure is very impressive. We took a train to Geneva from the Bern railway station. The train arrived at Geneva and within a few minutes of alighting I realized that my mobile phone was missing! After a frantic search and inquiries, I headed to Geneva airport, where the train had terminated. My joy knew no bounds, and a sense of great relief having found it! The honesty of Swiss left me completely in awe! I stepped out in the balcony of the hotel located in the midst of the Old City to admire the distant Alps with snow clad peaks. The morning rush hour had begun as we waited for a tram to take us to Saleve. Mont Saleve is a tourist attraction in French territory from where one can have a panoramic view of France/ Switzerland and the return trip is about 70 km. On return from an interesting trip from Saleve we took a tram for the Nations station (short for United Nations). A 20 minute ride brought us to the imposing building of the UN and adjoining International Red Cross. We went around and saw the photo graphic exhibits and marveled at the beautifully maintained buildings of the two great international institutions. We then returned to the city to see the Jet de Au (the fountain in Lake Geneva) which sends a stream of water jet 140 feet in air. The adjoining park has a beautiful, Flower clock where the background changes with season. There are a lot of historical sites worth a visit in old town in a radius of 2 km like Monument Burnswick, Statue of Gen Dufour, Le Corbusier, cathedral St Pierre and the old and majestic Hotel de Ville. Since we had to reach Zurich by the evening, we checked out of the hotel and took a train. We arrived at Zurich Airport station and headed for the hotel. We decided to go to St Gallen , a very small city where no vehicles are allowed in the old city. It is a sleepy, poetic town. Within 2-3 hours one can walk around the small streets of the old town which has beautiful architecture. The majestic cathedral built in 1767 in the Lake Constance area is a UNESCO heritage site. There are many other attractions like, Vadian memorial built in the memory of the great reformer, museums and a huge Hotel Einstein within the old city. We fed the pigeons at the market square where we sat down to get a breather. The pigeons apparently liked the spicy Indian snack! After spending about three hours, we took a train back to Zurich. We headed to the Bahnhoff Street, and indulged in window shopping. An excursion on Zurich Lake followed lasting about 90 minutes giving a glimpse of this big city. On return from the boat cruise we saw the ‘Flower Clock’. The rest of the evening was spent in strolling at nearby Paradeplatz, the vibrant town area, Framunster, where once noble women lived, St Peter’s church and a walk to Limmat River. We finally rounded the day with a lovely pizza at a local pizzeria! How the time flies! It was the day when we had to bid adieu to lovely Switzerland. We went to see the Botanical Gardens which is about 20 minute drive from the city centre. Switzerland has so much natural beauty that one never tires out and looks forward to seeing more and more of it. All good things come to an end and so did this dream trip as I woke up from the slumber and opened eyes to see my wife holding a cup of steaming hot tea for me! Lucky you...I am saving pennies for Europe trip, God knows when will it happen. Seriously they play recorded cow sounds? Sounds a bit funny. And I would love to believe the story of Mt Pilatus, what fun and adventure and spooky too. Out of all the destinations you have mentioned, my pick would be Bern for obvious reason. One thing I would miss is Cheese factory, I can't stand the smell of some variants. That is true about Switzerland. And Sir I don't like chocolates either...I will spend some time with the grazing cows. Wow! beautiful trip to one of the most sought after destination. How I wish I could settle there permanently away from all the dirt and noise filled world we are living in. Best of luck! I feel much he same way as you Rama! Thanks a lot! I hope that you win the contest because i enjoyed reading this post! You are an ideal hubby fulfilling your wife's desires and taking her to her dream destination ! Good Luck for the contest. Ha Ha Rama, Thanks a lot! Sometimes your wish list just coincides with that of your better half, so what more could one ask for! A fabulous trip to the most beautiful destination. Seeing the cheese and chocolate manufacturing must be an amazing experience. Sounds like a wonderful place to visit dear Rahul, lovely photos. Indeed a lovely destination Dianne! Thanks for your best wishes! When i began reading your post i thought the visit will be in dream--but it turned out to be dreamy.It indeed seems to be a superb destination. Thank you Indu! Sometimes the reality becomes dreamy and this sure was one such time and yes Switzerland is definitely well worth a visit! Well nice to actually visit to some of these places. I have been to some of these places you have mentioned and it brought me memories. I am sure you could have related to the beauty having been there Asamptha:)Thanks a lot! It must have been an experience of life. On my first visit to Geneva...I was amused seeing nothing but Banks,Chocolates,Watches and Cheese. This is really wonderful tour. I am honored that you found this post fit to bookmark, Ashwini:)BTW most places in Switzerland can be randomly chosen and would turn out to be an experience of lifetime! What struck me most about Switzerland besides the lush greens, crystal lakes and the Majestic Alps was the complete absence of people. I saw more tourists than Swiss in Switzerland! Exactly! who wouldn't want to go the land of perfect landscapes. Can't wait to see that part of the world. Ah, Switzerland! It is a dream destination for me too. Awesome post all the best. Sure book your tickets and plan a holiday soon, Ramya!Can provide more information when you need so that the travel can be a really happy one for 2 more(?) travelers:)A big thanks for your best wishes! It is great reading about you enjoying in the Alps, Rahul ji. Someday, I too will start saving for some trip like this or the one to Sri Lanka you wrote about. Visits to the Chocolate and Cheese factory, I am seriously jealous. I do plan to visit Switzerland hopefully in the future. Apologies for the late comment on your previous post. Health issues kept me away from blogging. Hi Rahul, this exciting Swiss itinerary is truly wonderful, you have brought the place to life by your exceptional writing. The cheese and chocolate factory visits sound like the greatest delight! A deserved win, I wish you the best! Thanks a lot for your kind comment! I have visited your site and it has a lot of tourist information which is an asset indeed! and I wish that you keep visiting such awesome places both in dreams as well as in reality. Land of the pristine Alps, the crystal clear lakes, green meadows, milk and chocolate and punctual Swiss watches indeed! Loved the post Rahul sir and now dreaming about Switzerland. Wow, its so nice. I hope my dream wish comes true soon visiting such a lovely place. I really liked your post. I am sure you and your wife must have a wonderful trip.